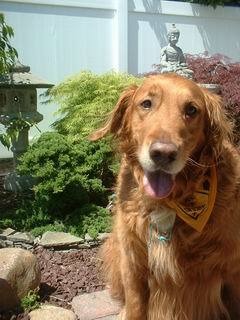 We want to take this opportunity to thank the LIGRR for providing our family with the opportunity to adopt Jake, a wonderful Golden that joined our family in March, 2001. We will never forget the day we first met Jake. He was the biggest dog we had ever seen, but his loving, gentle and kind nature overshadowed his size, and it did not take long for Jake to worm his way into our hearts, where he has remained ever since. Jake and our son, Steven, who was 6 years old at the time, quickly became inseparable. Steven, an only child who was very lonely, also has Autism and has difficulty forming relationships, so it was very important for Steven to bond with the dog we adopted. It has been almost two years since Jake has joined our family. We will be celebrating his 7th birthday on New Year's Day. Jake has changed our lives forever. He is truly remarkable, and very adaptable. He relates successfully to people of all ages. He is calm and gentle with my elderly Mom, and playful and energetic with children. Jake is the mascot of Cub Scout Pack 888, a cub scout pack consisting of Autistic children that we lead. He is very popular with the boys, and is quite a celebrity with cub scouts and leaders from many packs and troops across Staten Island. In fact, during a recent Cub Scout planning meeting, the organizer of the annual Staten Island Boy Scout Hike wanted to be sure that Jake would be coming to the hike this year! Attached is a picture of mascot Jake. Jake is also very sensitive, and empathetic. When my dad passed away earlier this year, Jake, who was very fond of my dad, whimpered for several days and refused to eat, as he was in mourning. He was also a great source of comfort following the events of 9/11. He certainly helped us all though some very difficult times. We have owned other dogs in the past, but none like Jake. We want to thank you for bringing Jake into our lives. He has brought us all so much joy and happiness. Keep up the good work. God Bless You All.